It's a day near timberline in Rocky Mountain National Park thats fit for neither man nor beast. A late autumn snowstorm has moved in over Trail Ridge Road and the Ute Pass area closing down Trail Ridge Road for the season and sending most visitors back to their hotels and cabins. 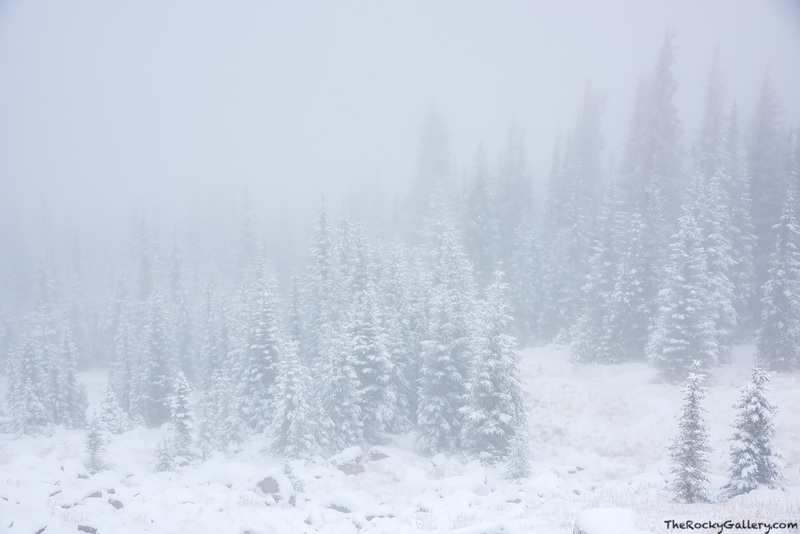 Near the Ute Pass trailhead it was a winter like wonderland as the evergreens were covered in fresh snow and fog. While most people would rather not be out on days like these, the quiet and solitude of a mountain snowstorm are conditions I love to explore in. Photo © copyright by Thomas Mangan.